All over the world coral reefs are dying out. Marine pollutants, agricultural run-off and, above all, global warming, are taking a toll on these fragile marvels of nature…Politicians may be able to deny global warming, corals, sadly, don’t have that option. While it is very fashionable these days to blame nearly any environmental crisis on “global warming,” we have no idea what the key factor in the loss of coral reefs is. Indeed, we don’t even know if there is a key factor. There might be several processes that are working together to produce this global loss of coral, and some of them might be completely unknown. However, an international team of researchers has found one thing that is definitely harming coral, and it certainly wasn’t anything I expected! The researchers realized that there is at least one contaminant in the oceans that has been steadily increasing over the past few decades: oxybenzone. It is found in nature, but not in the ocean. It is produced by plants to provide protection from ultraviolet radiation that comes from the sun. In the 1980s, it was approved by the U.S. Food and Drug Administration for use on people. As a result, a wide range of cosmetics now contain oxybenzone, and it is a common active ingredient in sunscreen. In their study,2 the researchers took samples of water from coral reefs in the U.S. Virgin Islands and Hawaii. They found that all samples contained oxybenzone, and the more popular the reef was with tourists, the higher the concentration. They then tested the effects of oxybenzone on coral larvae and adult coral cells in the lab. The results were significant, even at relatively low concentrations. Exposure to oxybenzone deformed coral larvae, making them unable to float with the currents, which is the way they have been designed to disperse. In addition, the larvae suffered damage to their DNA. Amazingly, the concentration at which this happened was very low: 62 parts per trillion. In other words, only 62 molecules of oxybenzone among a trillion other molecules in marine water can produce harmful effects in coral larvae. 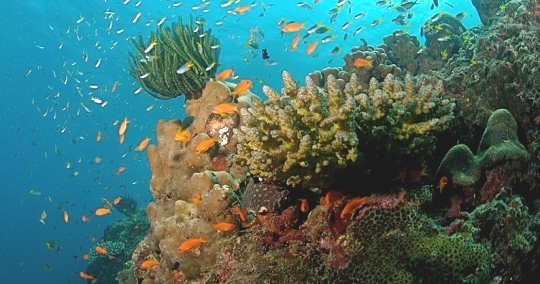 The concentration found in the waters of coral reefs off the U.S. Virgin Islands was up to 23 times higher than that. Adult coral can be harmed by oxybenzone as well. Individual coral cells were killed by oxybenzone concentrations comparable to what was found in the U.S. Virgin Islands, and many cells that survived suffered DNA damage. The researchers also showed that exposure to oxybenzone increased the rate of coral bleaching, which can lead to large-scale coral death. The toxicity of oxybenzone increases with sunlight, which is unfortunate, since corals need sunlight to survive. In the end, then, this study makes it clear that oxybenzone is a threat to the health of coral reefs. This, of course, poses a dilemma for people who love the beach but don’t want to get sunburned. If you lather up with sunscreen, as recommended by doctors, you risk killing coral when you swim, snorkel, or scuba dive. You could choose from among many oxybenzone-free sunscreens, but we have no idea what the effects of their active ingredients will be on coral. Remember, oxybenzone is a natural chemical! I do know this: I will no longer put on sunscreen before I scuba dive, and I will tell every scuba diver I meet about this study.